You can always feel the edge of a season, like a thumb pressed slowly against a knife blade. There’s something deep in the brain that sounds the alarm, that tells you: Get ready. In my hometown of Eugene, Oregon, the first sign of fall is that good rain that cleanses the air of its summer haze and makes it clean and new and full of soft electricity. Then the rain comes to stay, and saturates the soil, and the patient plants drink their fill and become strong again. And the leaves start to turn and then fall in sopping heaps, and the soggy runners that you pass are all beaming. When you move to a new country, you get used to being two steps behind. You always find out about things right before they happen or right after, and you only understand jokes when you’re given a minute to think. But I know that fall has arrived. Though the signs are unknown to me, I can read them without thought. The 峒河（dònghé, dong river) was once a band of cool jade. It hardens now, it slows and collects duckweed. The sun is tired and orange. And the food shows the flow of the seasons here more than anywhere I have been. One of the first things I noticed when I got off the train coming back from Zhangjiajie was the changes in the sidewalk food vendors. Where five days previously people had been selling tomatoes, they now sat peeling long stalks of sugarcane, to be sold as a snack to kids. There were whole carts filled with nothing but oranges, and the kiwis I found were the most flavorful that the world has ever seen. 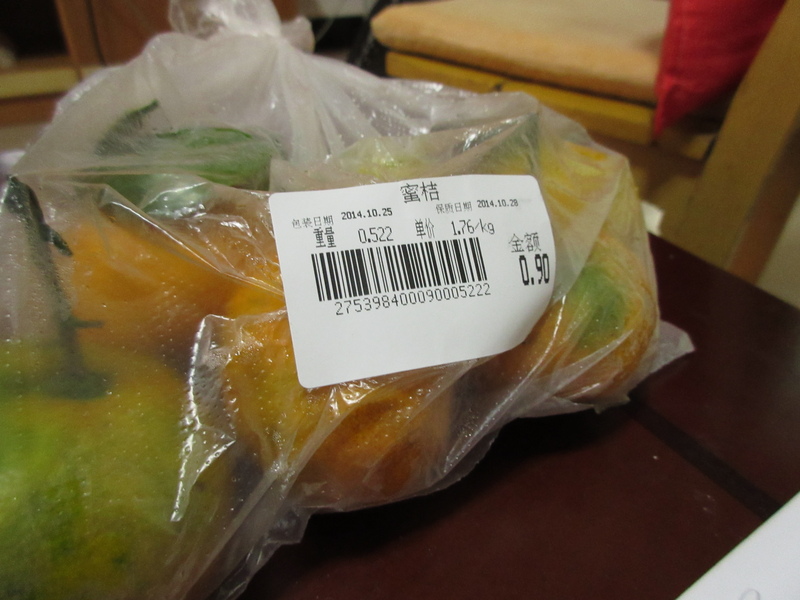 I was already laden with oranges (gifts from my gracious hosts in Zhangjiajie), but when I ran out a week later I found that they were going for $0.13/lb at the local supermarket. Fall and winter mean less rain and colder temperatures, so the emissions from the cars and the coal-powered cooking stoves have started to build up. It’s still a lot better than any of the bigger cities, though, so I’m grateful for that. It’s really not noticeable unless you stray too close to a fried rice place–they have to pick up the pans a lot to keep the rice from sticking and you learn to hold your breath whenever you pass. Of course, I’m not complaining: fall has brought us hairy caterpillars with chartreuse mohawks. And really, what sane person could ask for anything more than that? I think it’s things like this that hold you to a place. Little changes like these give you the feeling that you’re sinking in, that you have seen more than just a glance. I wrote most of this post this afternoon, but left it for further revisions. At dinner, a student told me that normally fall comes much earlier, that it’s stayed hot for too long. I don’t know what this will mean for the farmers, but it’s something I’ve heard a lot lately, and in a lot of different places. This isn’t how it used to be, it’s not how it’s supposed to be. I love the caterpillar and would like to have one around here for a pet. That would be an invasive species, though, so better leave her there. There’s also a limited shelf-life. Who knows? You could end up with the world’s most boring butterfly. The first sign of fall besides the obvious cool front moving through Austin, is the hundreds of grackles loudly squawking in their favorite roosting trees at dusk. Weird that there are always grackles here, but their numbers, roosting in trees that you dare not park under, explode in the fall. My students were astonished by images of Canada geese migrating through North America, but I didn’t get the chance to ask why. The birds seem more settled here, but I don’t know if that’s true.